Tablescapes, settings, and centerpieces...oh my! Hellooo beauties! We have had so many amazing table settings out at Peach Creek Ranch we just HAVE to show off!! Our brides have really done some amazing things with their decor with the help of our coordinator and their amazing vendors. We know sometimes you need a little inspiration to get those wedding planning juices flowing, so here are our some of our fave tablescapes to really stir that creativity! This wedding was right around Valentine's day and it was full of roses and romance. We love these tall, dramatic rose centerpieces surrounded by perfectly placed table settings wrapped in red. The dark shade of the table cloth really brings out those pops of color and hints of shine in the mirror and the napkin rings. We can't get enough! Chanel & Jon's wedding decor was so precious everywhere! Go check out our blog featuring their wedding from our "Real Weddings" series to see more! We especially adore their sweet tablescape. It had the perfect amount of pink and just the right touch of that gold sparkle with their table runner. They also had adorable wooden hearts strewn around their gorgeous floral centerpiece to add a touch of personalization. Those origami rose napkins and twisted chair covers really took these tables to the next level. Kayla & Lane's tables were full of greenery and elegance. 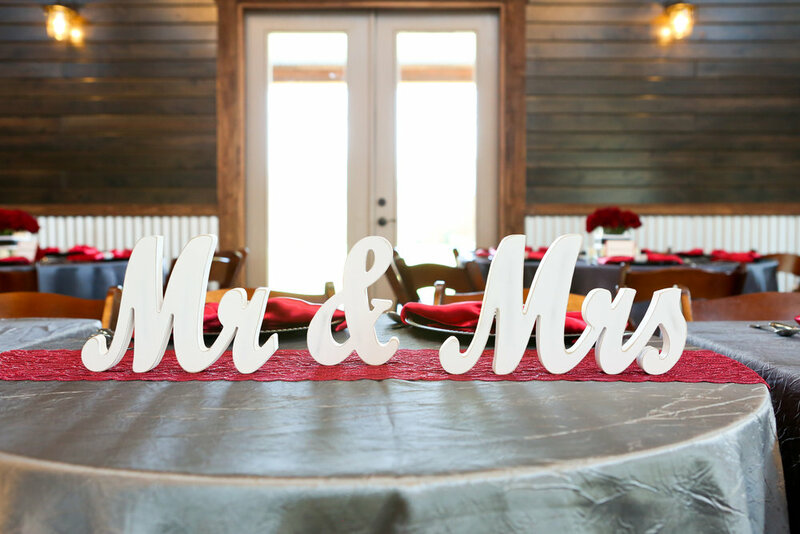 We are in LOVE with their sweetheart table adorned with those precious "Mr. & Mrs." block letters in between that beautiful floral arrangement. They used a long rectangular arrangement for their head table, complete with candles and more of that greenery we love so much! Their guest tables were simple yet decadent with gold chargers, candles, and smaller floral arrangements perched in the center. Kayla & Lane have also been featured on our "Real Weddings" series...go check them out for even more beautiful wedding inspiration! We were floored when we saw the way these tables were transformed with this adorable decor. 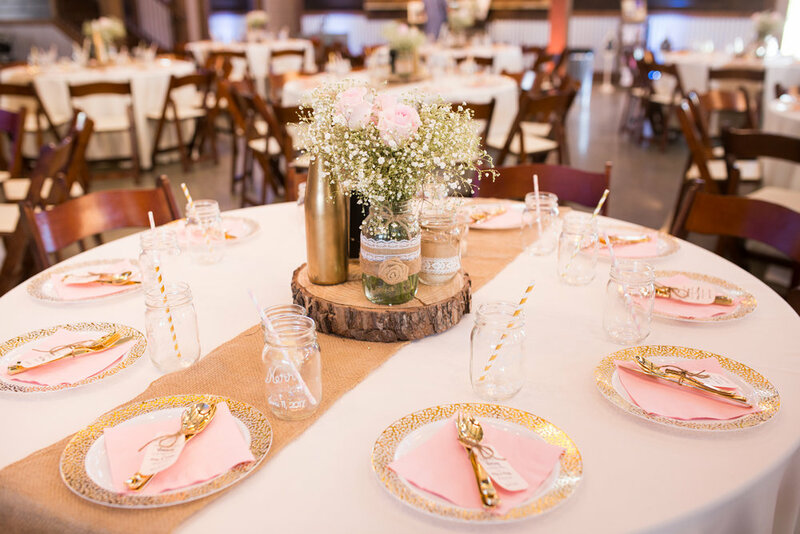 The wood slab centerpieces with mason jar floral arrangements bring the perfect touch of rustic while the gold plates and DIY re-purposed wine bottles give it a nice chic spin. 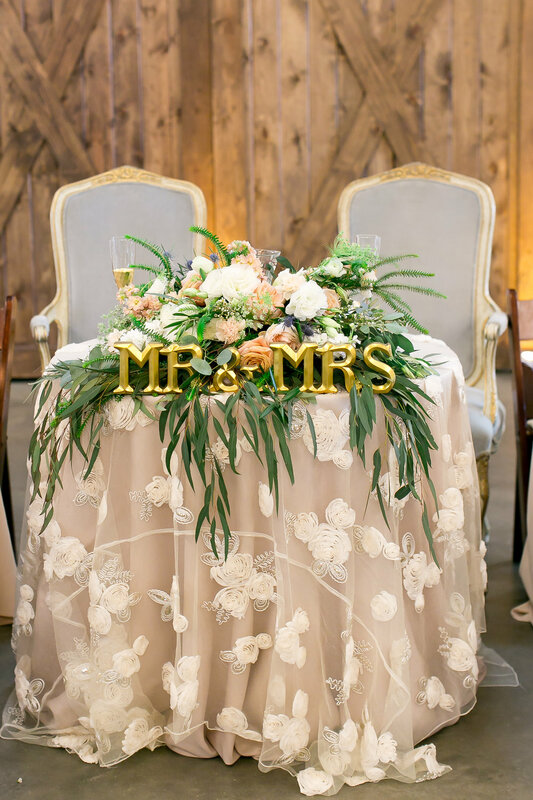 The texture element from the sweetheart table cloth really brings the decor to a new level! And aren't those mason jars so cute...guests got to take them home at the end of the night! Haley & Drew's wedding was beautifully designed from beginning to end, but we especially loved their table settings. Their head table, for starters, was absolutely gorgeous with that subtly sequined navy table cloth and beautiful greenery behind them on our barn doors and their centerpiece. They chose to use two of our vintage chairs to continue the hues of blue throughout their decor. The earthy feel carried over into their guest table centerpieces with the wood slabs and greenery. We were so in love with their personalized touches. Haley & Drew met in a college town, and each table was adorned with a different street name from that town. HOW CUTE?! The personalized touches didn't stop there, however. We were swooning all over again at the adorable picture at each table setting. Thanks so much for stopping by our blog! We have loved looking back on these gorgeous weddings. 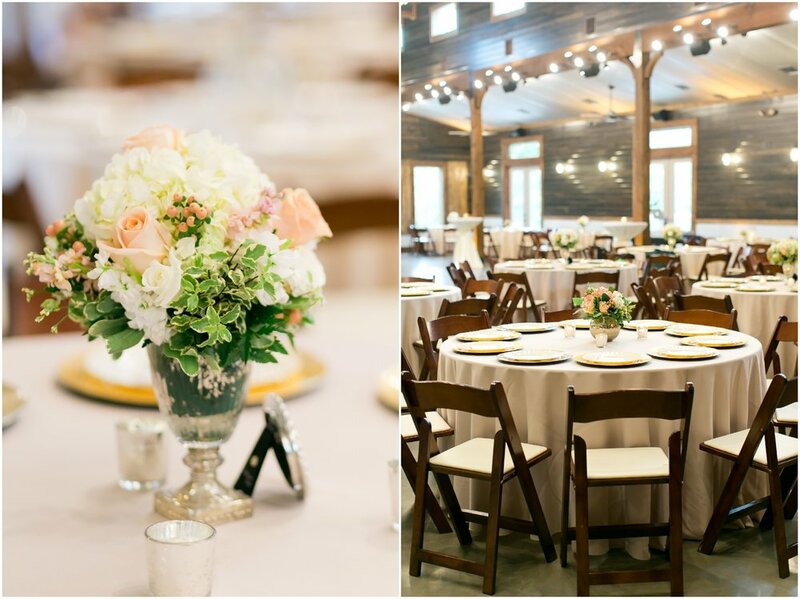 Every wedding at Peach Creek Ranch is so different, and we hope that you have gotten some inspiration from all sorts of different tastes and types of table settings! Check back next time for another featured wedding! Until next time, stay peachy!! !